You will be following along on trips in the footsteps of Ibn Battuta, the famous 14th century traveler. Along the way you will see many of the same sights that he saw. There will be many links to help you understand what he saw. There will even be links that bring you into "side trips" and enable you to see into the future - beyond the 14th century. We don't know what Ibn Battuta looked like, except that he had a beard. This drawing is from National Geographic Magazine, Dec., 1991. He met many dangers and had many adventures along the way. He was attacked by bandits, almost drowned in a sinking ship, was almost beheaded by a tyrant ruler, and had a few marriages and lovers and fathered several children on his travels! Near the end of Ibn Battuta's own life, the Sultan of Morocco insisted that Ibn Battuta dictate the story of his travels to a scholar and today we can read translations of that story called "Rihla - My Travels". Much of it is fascinating, but some of it seems to be made up and even is inaccurate about places we know about. However, it is a valuable and interesting record of places which add to our understanding of the Middle Ages. This is a map of the Muslim World about 1300. 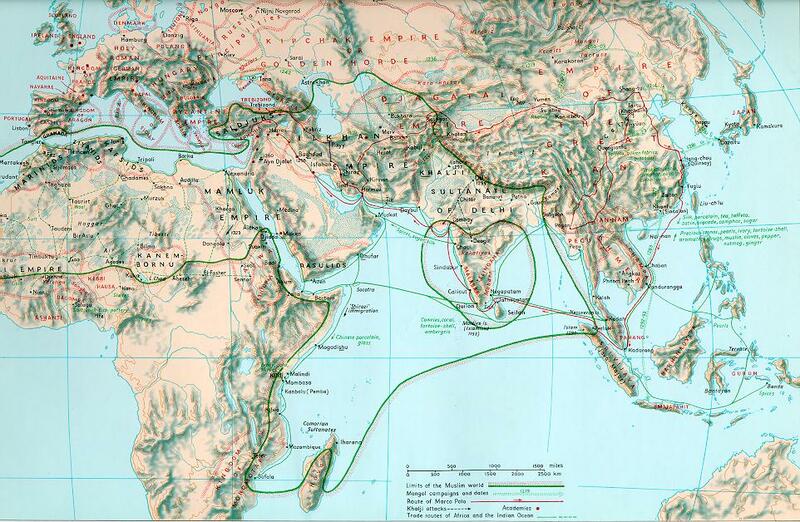 Ibn Battuta mainly traveled in the area surrounded by the green line - countries with Muslim governments. Beyond that, Muslim traders had already ventured out into China, Indonesia and further, and had established small Muslim communities in more regions of the world. Ibn Battuta would seldom be far from fellow Muslims on his travels, and he would greatly benefit from the charity and hospitality offered to Muslim travelers and pilgrims. Are you ready to begin your trip? If so, click [here]. Many thanks to Ross Dunn, author of The Adventures of Ibn Battuta for his support. To read a student interview with the author, press [here]. World Affairs Council, San Francisco Unified School District CIPD, and many students at Horace Mann!